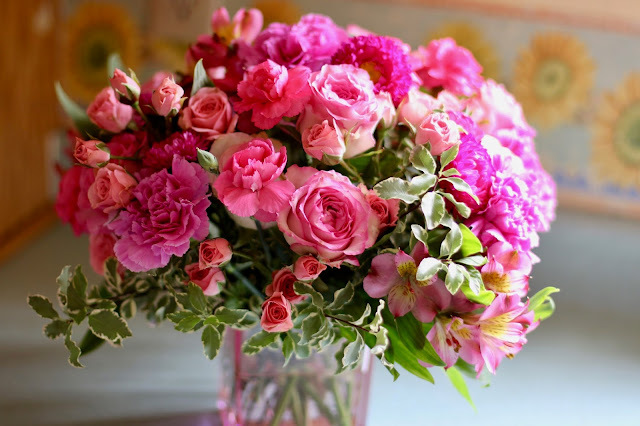 If you have ever received flowers- expectedly or not, you know how special it makes you feel. I remember one random January receiving a fabulous bouquet of flowers to my parents’ house addressed to me. My sister answered the knock and brought in me a fabulous bouquet of flowers for me. I had never received flowers before, and I felt super special- not to mention that the whole house felt happy every time we passed the bouquet. Although I never learned who they were from (! ), I have also never forgotten how amazing I felt that day, and will send bouquets of flowers as thank you notes, housewarming gifts, and just because. That’s why I am so excited to send flowers AND support charity with Teleflora. October is officially Breast Cancer Awareness month and Teleflora will be honoring Breast Cancer Awareness by donating 15% of the purchase price from each sale of their Teleflora’s Pink Grace bouquet to the Breast Cancer Research Foundation. They will do this year-round! The Pink Grace Bouquet (pictured above) is a stunning floral bouquet arrangement of pink roses, pink spray roses, hot pink carnations and soft pink alstroemeria accented with assorted greenery. And who wouldn’t want to be surprised with a bouquet like that? Teleflora would love one of Pura Vida Mom’s lucky readers to win a $75 Gift Code so you can share the love to someone special in your life! One winner will be randomly selected by PromoSimple and will have 48hrs to respond. Failure to do so will mean forfeiting your prize and a new winner will be chosen. Good luck, and make sure to enter the giveaway below!